Based in Portland, Oregon, KEEN footwear was founded in 2003, with the mission to provide high quality products to an inclusive, outdoor community while demonstrating integrity and leadership, especially on social and environmental commitments. Community, environment, the desire to dare to do things differently, and acting with respect and integrity. KEEN's operations and company culture reflect a stand out commitment to build a strong community and healthier planet where we can all create, play and care. In 2004 KEEN established a giving program called Hybrid, which has since donated more than €6 million in cash and resources to not- for-profit organisations around the world. Our latest initiative – the KEEN Effect II program – encourages KEEN fans to nominate non-profit organisations that align with the company’s outdoor-focused, core values for one of 10 grants. Through KEEN Effect II, KEEN is looking forward to supporting organisations that inspire responsible outdoor participation as a way towards building strong communities, creative and sustainable thinking, and introducing new audiences to the outdoors. What inspires you and your products? Innovation. It's in our DNA. KEEN was launched with the industry defining Newport sandal – a product internationally renowned for its forward thinking hybrid design and patented toe protection. This unique sandal revolutionised the sport sandal industry and provided the catalyst to launch the brand's outdoor causal and performance footwear lines. 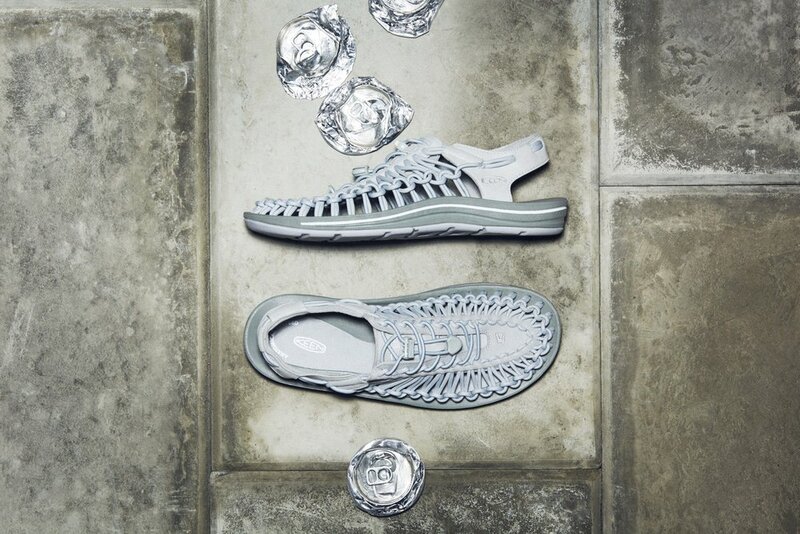 Since you launched the UNEEK sandal, it seems to have been adopted by curious and unconventional adventurers. How would you describe the spirit of a KEEN hybrid lifestyle? Our fans love to create possibilities; to play and explore in any place without a ceiling, while acting responsibly and with compassion for the world around them. The hybrid lifestyle is about splitting time between work and play, fun and function, and giving back to the people and planet around us. Whether exploring remote coastlines, traversing mountain trails or pounding city streets, the hybrid life mantra is about following your feet for adventure and embracing the journey. Our ambassadors are always seeking moments of bliss under the open sky, such as adventurer and film maker, Dave Corthwaite who challenged himself to complete 11 journeys of over 1,000 miles using only non-motorised transport through to kayaker and adventure athlete Laura Kennington who is on a mission to encourage and inspire people to follow their passion and push their limits. Hybrid life is about expressing individuality, embracing unique adventure and daring to think differently. How has the UNEEK sandal evolved since it’s launch in 2015? With its innovative construction, comfort and functionality, KEEN’s UNEEK sandal embodies our vision a hybrid lifestyle. For SS16, UNEEK returned in a stunning array of 21 colours and patterns – from stylish monochromes, solids and stripes through to a new camo coloured cord option and choice of an 8mm flat cord. This summer KEEN were super excited to also present the UNEEK O2, expanding our open air footwear range by taking the two-cord upper and pairing it with an enclosed heel panel for maximum comfort and versatility. 25 per cent lighter than its predecessor, the UNEEK 02 is infused with KEEN’s DNA of durability and comfort. Looking ahead to SS17, UNEEK’s creative team have developed some incredible special edition lines, including premium leather editions and an urban trails pacs featuring athletic gum rubber outsoles, offering even more opportunity for our fans to pursue an active and fulfilling life. What should we look out for in AW16? We're excited about our new AW collection, which comprises a diverse range of beautifully constructed shoes and boots designed to meet the needs of our fans and their diverse lifestyles. The Feldberg Mid WP (£140) is a premium crafted hybrid hiker that epitomises duplexity. It takes its name from two peaks in Germany – one, a famous hiking destination in the Black Forest and the other, a popular urban destination on the outskirts of Frankfurt. Built equally for outdoor recreation and for urban exploration, the Feldberg will resonate with the mountain lover and the asphalt cowboy, the easy wanderer and the global explorer. Choose from urban-friendly anthracite or earthy brown, the Feldberg is available in either a handsome premium nubuck leather or suede upper with a breathable KEEN.Dry® waterproof membrane, providing reliable protection against the elements. Launching for women this autumn, our new Bridge City collection is a fashion and function conscious collection blending outdoor leathers with street ready versatility, transitioning effortlessly from day to night. From the stunning East Side Bootie to the Lower East Side Lace, the collection is spanned with an eclectic assortment of artisan textures, stitching and intricate detailing. Built with a focus on the modern adventurer, Bridge City spins off of KEEN’s DNA of hybrid versatility and comfort while infusing elements for the urban landscape, allowing our fans to personalise their style.